Ring out the old…ring in the new. Investment trends rarely have their beginnings and end points neatly aligned with the calendar. But, this New Year is being greeted by a significantly changing investment climate. Following are (relatively) short “chapters” covering topics we believe are shaping the changing investment climate for 2015 and beyond. Change brings disturbances to the “status quo” and is creating varying degrees of economic discomfort across the globe. Therefore, the emerging investment climate may well lead to periodic bouts of heightened fear, uncertainty, and doubt within the financial markets. Despite the potential for increased volatility, we believe the emerging climate will prove rewarding for many investors. The chapters lay out our rationale. Happy New Year! The investment trends of the past several years—the “commodity super cycle”, “peak oil”, the “emerging markets century”, and the wide-asset-allocation portfolios broadly adopted as the way to benefit from these trends—are being “wrung out” as underlying conditions are changing. The sharp decline in oil and gasoline prices in recent weeks may seem like the loudest ringing bell in this regard, but it’s just the latest within the context of the changing investment climate. The prospect of the “old” trends re-exerting themselves any time in the near future also look very unlikely. The changes that are unfolding appear structural in nature. There are two sides to oil price weakness. The demand side has cooled considerably as the recent price setter of most all commodities—China—is experiencing an economic hangover from its prolonged boom. 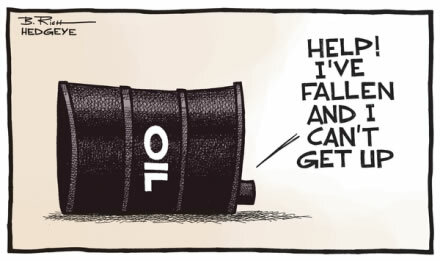 ”“In an unusually frank interview, Ali al-Naimi, the Saudi oil minister, tore up OPEC’s traditional strategy of keeping prices high by limiting oil output and replaced it with a new policy of defending the cartel’s market share at all costs. He said the world may never see $100 a barrel oil again. It represents a “fundamental change” in OPEC policy that is more far-reaching than any seen since the 1970s, said Jamie Webster, oil analyst at IHS Energy. Among those being more than just “touched” by the falling oil prices are the world’s petro-despots in countries such as Russia, Iran, and Venezuela. As their economies fall deeper into a financial bind as oil revenues plummet, the petro-despots could lash out in unpredictable ways. However, coping with rapidly eroding financial resources may render their power bases more precarious, in addition to making it more difficult to fund cross border mayhem. Another big change has occurred within many overseas economic conditions. Economies of all shapes and sizes have a remarkable tendency to display business cycles—that is, they experience a cycle of an expansionary phase followed by recession, followed by another expansion/recession cycle in repeating fashion. Hopefully, the recurring business cycle pattern occurs along an upward-sloping growth path, as has been true for the U.S. But that’s not always the case as Japan over the past 30 years can attest (for reasons we’ll discuss in a later section). 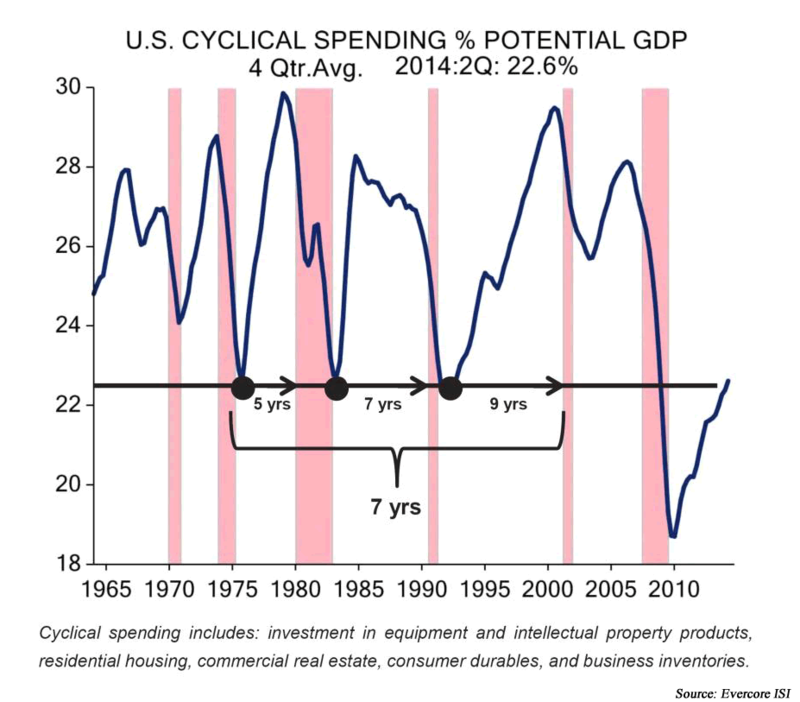 What are the dynamics behind a business cycle? The recurrent tendencies occur, in our opinion, because an economy reflects behavior patterns of human nature. The business cycle dynamics analogy we like to use is one of the athlete and the form-fitting material, spandex. When in their prime, spandex highlights the athlete’s lean physique. As the athlete ages, however, their metabolism may slow, they may exercise less, and it’s easy to consume excess calories. The spandex may still fit a past-their-prime athlete, but the spandex look is, well, much less flattering. As still more time passes, the seams of the spandex may well be pushed to extremes and even rip. Like the athlete, as business expansions age they accumulate excesses. As the “good times roll”, human nature leads to unsustainable debt levels, rising inflation, and redundant capacity in the form of inventories, real estate, and production facilities. This accumulated baggage distorts the economy’s spandex and may well threaten its “seams”. Like the proverbial straw that breaks the camel’s back, a downturn typically is triggered as policy makers adopt restrictive measures to combat the excesses. In much of the world—including the emerging markets—business cycle spandex is stretched. Growth has slowed sharply or recessions already have set in. The U.S. experience has shown—even in an economy with more dynamism than most others in the world—it can take years to work off accumulated excesses. Over time, investment dollars flow to where they are treated best. As wide-asset-allocation portfolios are positioned for trends that are fading, re-deployment back towards more rewarding U.S. assets may be part of the new trends as we will discuss in a later chapter. The U.S. economy in 2015 is likely to be marked by low inflation and solid economic growth. We have not experienced such a combination since the 1990s (an exceptionally good period for U.S. traded stocks by the way). Unlike much of the rest of the world, the U.S. has largely dealt with the excesses of the previous business cycle. The seams of the spandex ripped in 2008 and the Financial Panic was the result. Today, however, the business cycle spandex reveals a much leaner, more “fit” economic “physique”. Consumer debt burdens are near multi-decade lows (Chart 2), the savings rate has risen significantly, banks are better capitalized than they have been in 50+ years, and corporations are generating record amounts of free cash flow. Granted, economic growth remains relatively slow by historical standards. It will likely remain so, courtesy of Washington D.C.’s wet blanket regulation and taxation policies. However, the silver lining in the slow growth situation is that new excesses that will sow the seeds of the next recession are also likely to only slowly accumulate. The next recession (and there will be a next one) is likely some ways off in the future. Chart 3 below offers additional support for the notion that the current U.S. expansion likely has multiple years left to run. The chart provides a gauge of the most cyclical sectors of the economy (real estate, inventories, business spending on equipment, etc.) 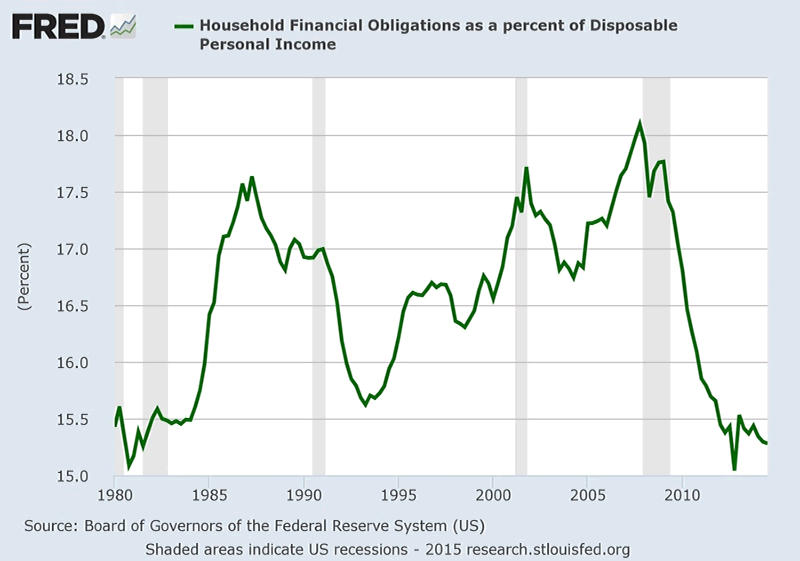 relative to the overall economy. The cyclical sectors exhibit the widest swings across the business cycle; they enjoy a “feast” (on a relative basis) during expansions, but suffer a relative “famine” during recessions. 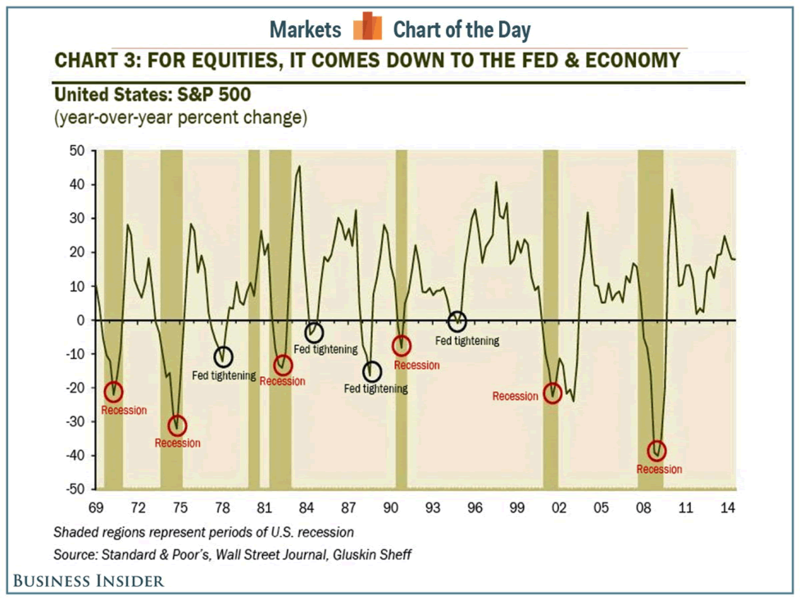 As the chart suggests, the cyclical sectors have staged a recovery from their 2008-09 Financial Panic “lows”. But they have rebounded back to only reach the low water marks registered at the bottom of prior recessions(recessions are the shaded periods in the chart). In the past few expansions—from similar levels as exist today—the cyclical “feast” periods lasted approximately 7 years. If anything close to this pattern is repeated this time around, this expansion could be a long one. The changing investment climate, meanwhile, has added to the domestic economy’s resilience in the face of the troubles abroad. While the decline in oil prices is touching parts of the oil patch (including in this country) in an unfavorable way as noted earlier, the fall in gasoline prices is giving consumers’ discretionary cash flow a major boost. The Federal Reserve Bank of St. Louis estimates that approximately 4% of pretax income is spent on gasoline for the average consumer. The decline in gas prices represents some $200 billion in fuel savings that we suspect will be spent elsewhere with greater multiplier benefits to the economy. In addition, employment gains continue and the breadth of job gains across U.S. industry sectors is better than it has been since the 1990s. Employment at both small and midsize companies is at record “highs” as is employment for the 25-34 year old age group. This demographic group is important for not only are they larger in absolute numbers than the baby boomers, they also are of the prime age to form households. Historically, this age group leads the way in home and furnishings purchases, auto sales and even starting up new business enterprises. We suspect this current crop of 25-34 year olds will ultimately resemble (to some degree) the historical pattern of prior generations. 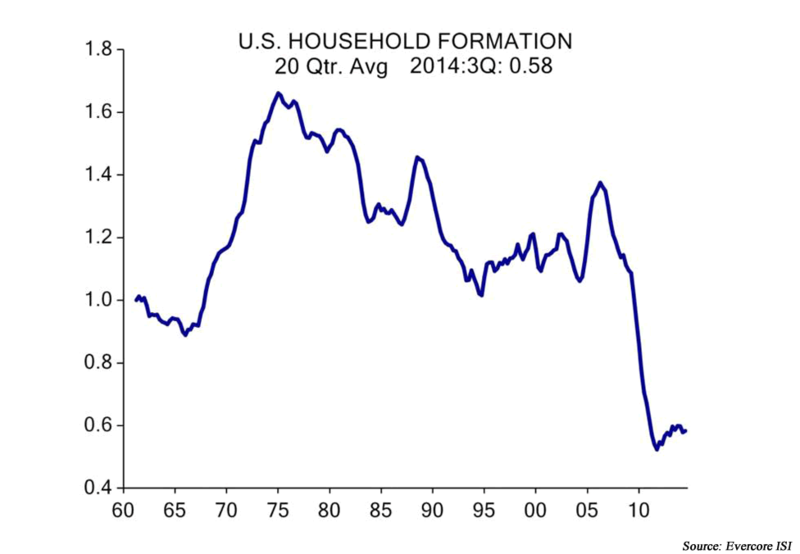 With household formations ravaged in the wake of the 2008 Financial Panic (Chart 4), significant pent up demand likely exists from this demographic. Their improving employment is probably a leading indicator of their future spending. As we have discussed on prior occasions, we believe the dynamism of the private sector is a key part of the secret sauce for economic growth. We used the term “secret”, for it strikes us that many experts still appear to significantly underestimate its importance. What is dynamism? It is the marketplace for ingenuity; where ideas constantly compete to meet the needs and desires of mankind by delivering new and improved products and services at increasingly affordable prices. Innovation operates as a dynamic process of constant problem-solving experimentation that requires a societal willingness to tolerate success, failure (see cartoon next page) and displacement of the status quo. We indeed have economic “issues” in the U.S., but the country remains exceptional in its willingness and ability to let dynamism flourish (see below). Granted, that may not always be the case, but it remains so at present. The even better news is that dynamism is rapidly becoming more “democratized”. Thanks to never-before-accessible tools (ability to search most all recorded knowledge on a smart phone, 3D printing, software simulation, cloud computing, internet of things) and an emerging ecosystem (crowd funding, increased access to affordable service bureau manufacturing), the barriers to entry in creating problem-solving products or services are plummeting, allowing more minds than ever before to participate in a meaningful manner. Cartoon: In other countries, business failure can have severe legal or cultural ramifications. Judging by Amazon’s top selling books, in the U.S. business failure is almost viewed as a stripe earned. The investment ramifications are real, potentially very large and will create significant winners and losers along the way. Many of the incipient trends identified back in Table 1 are the result of private sector dynamism. The current revolution in the domestic energy situation, for example, is the result of the ingenuity of intrepid, risk-taking experimenters that largely went against the grain of the conventional wisdom within the energy industry. In the last 40 years nearly every presidential administration sought an energy policy to wean the U.S. off “foreign oil”. Untold billions were no doubt spent on such policies. It took a bunch of risk takers from the private sector to make it happen. The investment implications for companies providing the emerging productivity tools are very favorable as well. To see our point, let’s back up a moment and review the relationship between productivity growth, innovation and economic growth. In the traditional view of economics, growth rests with the three variables of land, labor, and capital (machines and factories). In this traditional view, better land utilization, more workers, and more efficient capital causes economic growth. Of course, much of the world’s land has already been tapped as an economic resource. Meanwhile, growth in the number of workers (i.e. labor) is slowing across the globe. In most developed economies, demographics are either likely to be only a mild tailwind to economic growth (U.S.) or represent a major headwind (Japan, much of Europe, and soon China). With two of the three variables (land and labor) not expected to move the growth needle a great deal, the engine to economic growth rests on the third piston—capital. In recent years, the notion of “capital” in this context has been expanded well beyond the physical—of machines and factories—to include “human capital” as well. This broader notion of capital opens the door for recognizing the importance of innovation and new idea “recipes” as the driving force behind productivity growth. The latter is important for it is the fuel driving wages and the standard of living higher over time. The prospects for productivity growth—in our estimation—are quite bright as our earlier dynamism conversation suggests. For investors, companies that are providing the modern productivity enhancing tools (hardware, software, and services) represent fertile investment ground. Furthermore, the melding of technology and manufacturing (as the new tools become utilized) is triggering a manufacturing renaissance within the U.S.
Analysts at Blackrock2 note that: Innovation means US companies can do more with less. Profit growth of $1 requires just $.20 of capital spending today, versus $.50 as had been the case from 1950 to 2000. 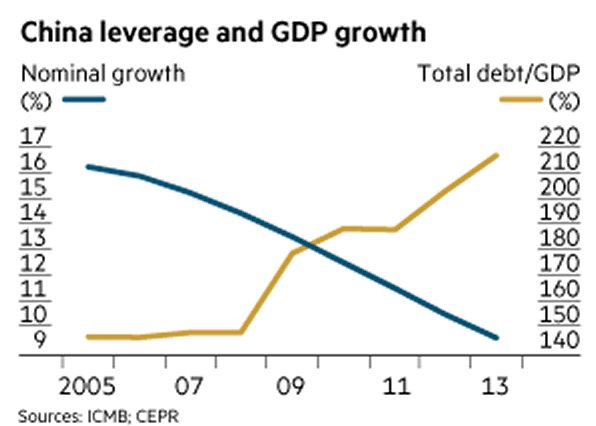 The recent financial crisis could be masking breakthroughs that are not yet captured in the statistics. In addition, many recent innovations such as web search tools are freebies for consumers. They generate activity that does not show up in traditional (economic) statistics. There is a long history of underestimating innovation and its impact on productivity growth and economic progress as we now discuss. Innovation is, of course, about new and largely unexpected things. So when pondering economic prospects, especially as the prediction time horizon extends, one has then to predict the unpredictable—the degree of innovation itself. Therefore, it is understandable to some degree that “experts” have traditionally underestimated innovation and U.S. economic dynamism. They typically underestimated it by a great deal. Following are a sample of forecasts by highly regarded individuals that were very wide off the mark. Experts at Western Union Telegraph Company—the largest corporation in the world at the time—rejected an offer in 1876 to purchase the patent to the telephone owned by Alexander Graham Bell. They thought the phone was “hardly more than a toy” and Bell’s idea to install a phone in every city was “idiotic on the face of it”. 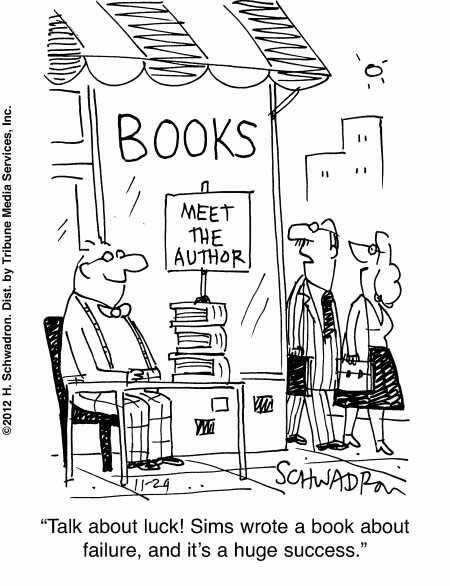 Our point here is not to poke fun. As has been true in the past, we suspect many are underestimating dynamism and innovation within the U.S. economy once again. One of the aspects of the changing investment climate outlined in Table 1 is the international exchange value of the dollar. From 2000-2011 the exchange value of the “buck” drifted lower. In recent months it has begun to establish a rising trend as the U.S. economy has demonstrated strength in a world of economic weakness. ”“During periods of dollar weakness, investments tend toward “real” (physical) assets – commodities and real estate – which are not exactly productivity enhancing. During periods of dollar strength on the other hand, investment is directed to more intellectual property, exactly the kind of investment that creates higher productivity. Rather than trying to just preserve their wealth, investors are able to concentrate on creating some. Over the past 40 years, the dollar has staged two major, multi-year advances. Both were associated with stock market surges, although with major drawbacks during both episodes. This confluence of trends represents a favorable backdrop for stocks in general. It should also be very favorable for shares of growth oriented businesses able to deliver stronger relative earnings growth, such as the portfolio of businesses we own. Yes, many companies’ earnings will be challenged by the weak economic situations abroad. But well managed growth businesses will overcome these challenges. How? By delivering the products and services that meet the needs and help solve the problems of today’s consumers and businesses. It may also be helpful to draw a distinction between “pullbacks” and “bear markets”. Severity and duration of declines are generally regarded as the defining characteristics. Pullbacks and bear markets both inflict plenty of investment angst of course, but pullbacks tend to be more modest and much shorter in duration. The most important defining aspect between the two is the underlying behavior of corporate earnings. In bear markets, corporate earnings usually decline—often they decline sharply. Therefore, bear markets tend to be associated with recessions. Pullbacks, however, can occur at any time. But since they generally occur during periods with rising corporate earnings, their duration tends to be relatively short as the rising earnings trend acts as a tempering agent of sorts. The next chart shows these tendencies by displaying the historical pattern of year-by-year stock returns for the S&P 500. The chart shows that most big down periods (bear markets) for the S&P 500 have indeed been associated with recessions. While the chart doesn’t reflect earnings trends, downturns (recessions) usually create downward pressure on corporate earnings. The other thing the chart reveals is that stock returns often are poor around periods when the Federal Reserve (Fed) begins to “tighten” monetary policy. Since monetary tightening occurs as the Fed is attempting to combat rising inflation during a business expansion, stock market declines during these periods tend to be of the pullback variety. Not fun to endure, of course, but usually these pullbacks are relatively short-in-duration events. It is not until the combination of tight money policies and stretched business cycle spandex occurs that the stage is set for the next recession and bear market. The Fed is signaling that they will raise key interest rates sometime in the New Year. History suggests the stock market may struggle as a result—but perhaps not. In the last business expansion when the Fed began tightening in 2004, stocks did not slump. Furthermore, within today’s low inflation environment and with the interest rates under the Fed’s control at 0%, raising interest rates this time around hardly compares to the “tightening” of policy that occurred in past cycles. Rather than tightening, the Fed is exiting its zero interest rate crisis policy mode. Allowing rates to “normalize” at market determined higher levels certainly seems appropriate given the increased resilience of the U.S. economy. Failure to do so may well create other problems as our final chapter explores. What worries us? Terrorism and adverse geopolitical developments. Also, the tendencies—from both major political parties—toward the expansion of the size and scope of government. We believe the state’s extending reach into the economy interferes with the mass flourishing that economic dynamism creates. We also have worries that the adjustment process by investors to the changing trends described in previous chapters could become a bigger issue. There may well be some speculators that employed large financially levered strategies involving derivative securities that need to be unwound in the face of the new trends. Such conditions could trigger nasty volatility spikes across financial markets. Coupled with structural changes in stock and bond markets that appears to impair market liquidity on “fast moving” days, and the potential exists to create longer lasting feedback loops as volatility intensifies fear, uncertainty and doubt on the part of investors. If established, such feedback loops could also potentially impact policymakers to pursue short-term remedies that cause longer-term issues. 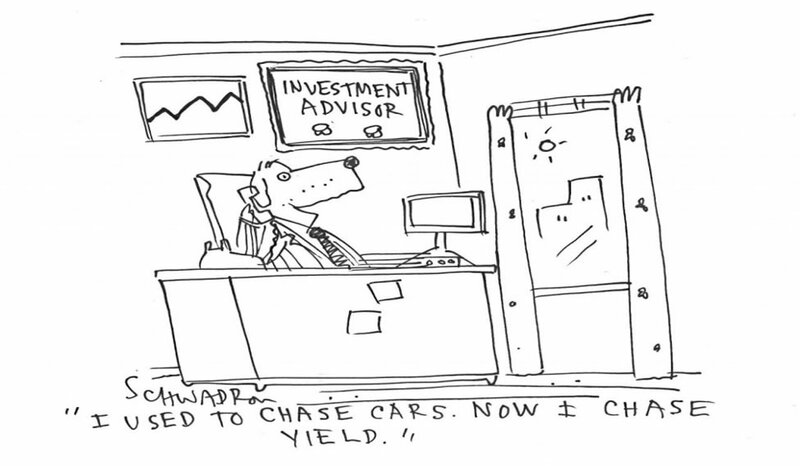 Along similar lines we are worried that the chase for yield will create troubles when yields do rise. Investors have searched every nook and cranny of the bond—and stock—markets for yield. Utility, many health care and consumer products stocks—generally low-growth businesses—now trade at growth stock-like premium valuations (P/Es) in part because of their dividend yields. Our valuation assessments suggest that many bonds and “yield stocks” possess unfavorable risk/reward profiles. They have little-to-no cushion, by our analysis, to absorb even a very modest rise in interest rates. This condition has only been exaggerated by the recent collapse in bond yields across much of Europe. Deflation fears across that continent have made yield chasing a global event. From a portfolio perspective, we believe bonds play a dual role within an investment asset allocation. They should provide a worthwhile return, but also be the low risk part of the portfolio to act as the shock absorber for stock price volatility. The poor risk profile of most bonds interferes with their intended “low risk” portfolio role. As a result, our bond strategies include investments with low interest rate risk sensitivity and (where appropriate) municipal bonds which possess more favorable risk/reward profiles. In summary, there are always worries and troubles. As the last few years have repeatedly shown, markets can “climb a wall of worries”. We believe the emerging climate will enable still more climbing to yield rewards for investors. 1 “OPEC leader vows not to cut oil output even if price hits $20,” Financial Times, 29 December 2014. 2 “Interpreting Innovation – Impact on Productivity, Inflation & Investing,” BlackRock Investment Institute, September 2014. 3 cybertelecom.org as relayed within Carpe Diem, “History: AT&T,” TD Ameritrade, 2014. 4 “Alvin Hansen,” last modified January 4, 2015, http://en.wikipedia.org/wiki/Alvin_Hansen. 5 Housel, Morgan, “If Japan is Our Worst Case Scenario, We’re All Right,” The Motley Fool, 3 February 2012. 6 “The Mystery of Alan Blinder’s Blindness,” last modified November 25, 2014, http://sigmundholmes.com/the-mystery-of-alan-blinders-blindness/.